This biography is from Swami Sivanandaji's book "Lives of Saints". 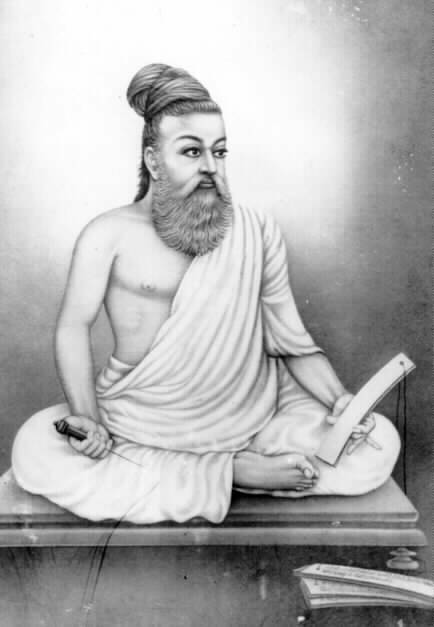 About two thousand years ago there flourished in Mylapore, Madras, a born Siddha and a born poet by name Valluvar or, as he is more commonly known, ‘Thiruvalluvar’, which only means, ‘the devotee of the Valluva caste’. Valluvas are Pariahs (now called Harijans) and their vocation was proclaiming the orders of the king by beat of drum. There is a tradition that Thiruvalluvar was the son of one Bhagavan, a Brahmin, and Adi, a Pariah woman whom he had married. Just as the alphabet ‘A’ is the beginning of all letters, so also, God is the beginning for this universe. Learn the Shastras completely and then act according to their injunctions. The Anicha flower will fade by smelling, but guests are more sensitive if the hosts turn their faces a bit. birth is like waking in the morning. These couplets are 1,330 in number. They contain the essence of the Vedas, the Upanishads and the six Darshanas. Thirukkural is regarded as a universal Bible. It is another Gita, Koran or Zend Avesta. Some aspirants repaired to Thiruvalluvar and enquired: "O sage, which Ashrama of life is better—Grihastha or Sannyasa?". Thiruvalluvar did not give any answer. He simply kept quiet. He wanted to teach them the glory of Grihastha Ashrama by example. Thiruvalluvar was taking cold rice in the morning. He said to his wife: "Vasuki, the rice is very hot. Bring a fan to cool it". Thiruvalluvar’s wife was drawing water from the well when Thiruvalluvar called her. She at once left the rope and ran to him with a fan to cool the rice. She did not say to her husband: "How can the cold rice be hot? Why do you want a fan now?". She simply obeyed his commands. The vessel that contained water was hanging half-way in the well unsupported, on account of her Pativrata Dharma Shakti. The aspirants noticed this phenomenon and the noble conduct of Vasuki and were simply struck with amazement. About midday, on another occasion, Valluvar called his wife and said, "Bring a lamp immediately, O Vasuki! I am stitching the cloth. I cannot see the eye of the needle. I cannot pass the thread properly". Vasuki did not say to her husband: "It is broad daylight now. Why do you want a lamp? You can see the eye of the needle clearly". But she implicitly obeyed his word. The aspirants were much inspired by the ideal life of sage Thiruvalluvar and the exalted conduct of Vasuki. They did not speak a word to the saint. They took leave of the saint and quietly left the place with profound satisfaction. They were deeply impressed by the practical and exemplary life led by Thiruvalluvar and Vasuki. They learnt the lesson that the life of an ideal householder was in no way inferior to that of an ideal Sannyasin who was treading the path of Nivritti and austerity in the Himalayan caves and that each was great in its own place, time and circumstances. Dear readers! Such ladies sit enthroned in the hearts of their husbands. No doubt they are hard to find, because such women never advertise themselves; but there must be many in our land of Rishis and sages; and unless we maintain such a high level of moral purity, we will all be going down in these days of modern civilization and scientific advancement. If the husbands of the present day behave like Thiruvalluvar, the wives will say, "My husband has become senseless. He wants to fan the rice when it is so cold! He wants a light when there is broad sunlight". The wives will rebuke their husbands and fight with them. That house wherein the wife serves the husband with sincere devotion and observes Pativrata Dharma is heaven on earth. That house wherein the wife fights with the husband and disobeys his orders is a veritable hell on earth. Ladies who practise Pativrata Dharma need not go to temples. They need not practise any Vrata or penance. Service to the husband becomes worship. They can realise God through service to their husbands. Husbands also should be ideal persons with noble qualities. Husbands are the Gurus for their wives. The wives need not get any initiation from any Acharya. Glory to such exalted ladies who practise Pativrata Dharma!